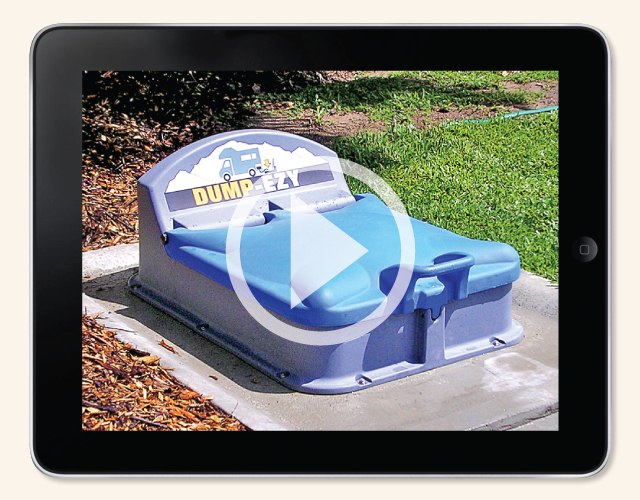 The Dump-Ezy dump point is the front end entry point of the waste stream. It is designed to be easily identifiable, attractive and user-friendly with simple to follow instructions. This innovative product comes off-the-shelf, is easy to install and includes built-in, simple but effective, self-evident, operational signage. 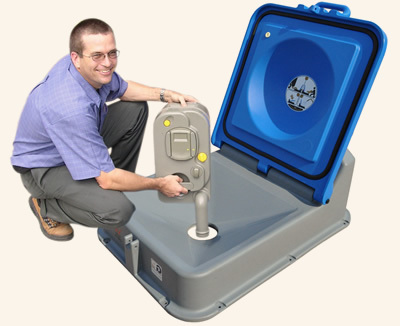 The lid is lockable and strong, yet light-weight and includes a moulded-in handle and a rubber seal. "Thank-you for your great product. Thought that you should see one of the uses that we have put the Dump-Ezy to. Now when the tank is almost full, the light turns on to motivate us to call for a pumpout of the tank before it overflows into the septic system. 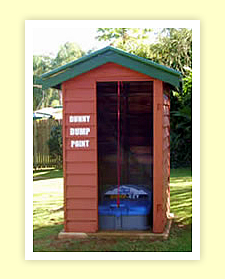 It has been working well for 12 months and we have only recently installed the old dunny over the Dump-Ezy to provide a unique talking point." Mapleton, Sunshine Coast Hinterland, Queensland, Australia. of this product. Pictures courtesy of Coral Coast Tourist Park.